This fine old building should be of great interest to those interested in American history and, particularly, the War of Independence – it was, after all, the home of Gilbert du Motier, Marquis de Lafayette, who fought alongside George Washington at battles such as Brandywire in 1777. His descendants still live here today. But the history of Chateau de Vollore is far more lengthy than its connection to US independence. Believed to date from the 12th century, it is said to be haunted by a lady called Blanche de Vollore who died in the castle’s dungeons over 700 years ago. 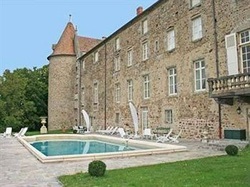 Chateau de Vollore offers just five guest rooms. It also boasts an outdoor swimming pool which is available seasonally.